With cerebral fat embolism syndrome, there is loss of consciousness. 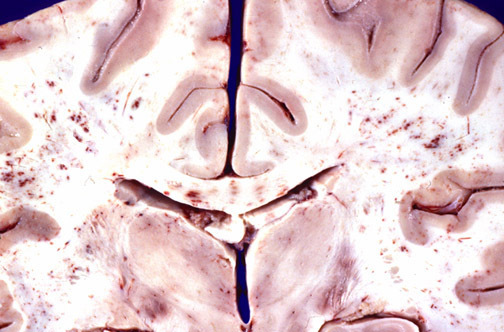 Note the multitude of petechial hemorrhages here, mostly within white matter. Cerebral edema and herniation may follow. Overall, few persons with a history of trauma will develop fat embolism, but it is difficult to predict which patients will. Protean manifestations include: hypoxemia, mental status changes, petechiae, fever, tachycardia, and thrombocytopenia.